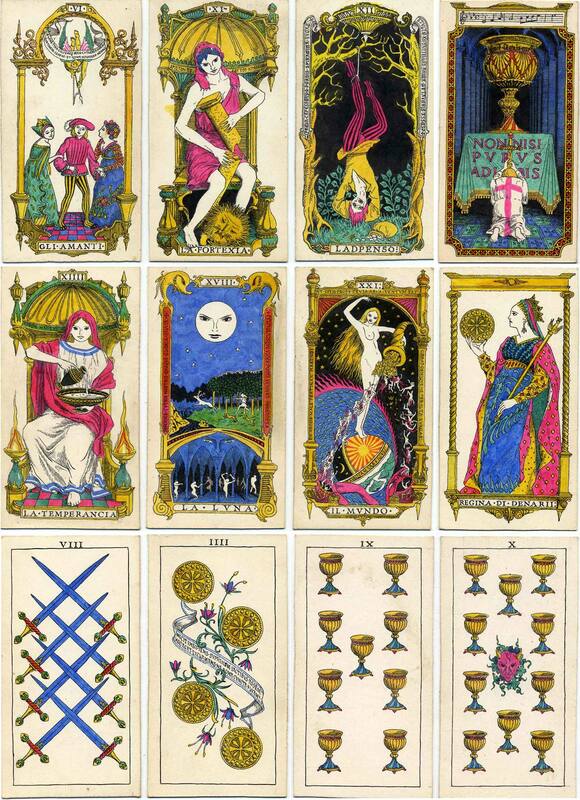 Above: original tarot designs in Italian Renaissance style by Oliver Mundy. The cards were drawn with a mapping-pen and tinted in water-colour. All artwork and notes © Oliver Mundy. Atout VI: The Lovers A young man is torn between two ladies, one dressed all in leaves and the other in flowers. Latin inscription, Florem inter foliumque mico; Cytherea rependit /Qua tenear cedens et qua desiderer absens (‘I flutter between the Flower and the Leaf. On the one side I shall yield and be held, on the other I shall be lost and regretted. Venus is the judge.’) The debate between the Flower and the Leaf – in other words, between Beauty and Functionality – was a popular trope in mediaeval times, mentioned by Chaucer among others. Atout XI: Strength Greek inscription, Ariston to heautou kratein (‘The best command is command of oneself.’) Caption, La Fortexia (modern Italian Fortezza) (‘Strength’). Atout XII: The Hanged Man Judas Iscariot, traditionally shown with red hair, hangs on a tree; the money-bag, the price of his treachery, lies below, where worms are gathering. Latin inscription, Praeda capessendo perdis spiramina, Judas; / Stulte, an tantillos animâ mutaveris asses? (‘Judas, you have lost the breath of life through your lust for booty. Fool! did you give your soul for so small a price?’) Caption, Ladpenso (mod. Italian L’Appenso) (‘The Hanged Man’). Ace of Cups A novice knight dedicates himself and his sword before the Holy Grail, which is inscribed Hic est sanguis meus (‘This is my blood’) and stands on an altar-cloth inscribed NON NISI PURUS ADIBIS (‘You shall not approach unless [you are] pure.’) The musical quotation above is from Wagner’s Grail opera, Parsifal. Atout XIV: Temperance – shown robed in white and pouring water into a bowl. Greek inscription (from the archaic Greek poet Hesiod), Pleon hemisu pantos (‘Half is [worth] more than the whole’). Atout XVIII: The Moon The goddess Artemis is seen in her three aspects: as the spirit of the Moon, as a huntress, and as overseer of the phantoms of the nether world. Latin inscription, Infernis tutrix, nostris quoque gloria silvis, / Caelivolansque vices ponti versura perennes (‘[She is] the Lady of the Underworld, an ornament to our [earthly] forests, and destined as she journeys the heavens to guide the endless ebb and flow of the ocean.’). Queen of Coins/Pentacles Archaic Italian inscription, Regina di Denarii ‘Queen of Deniers, or Pennies’). Eight of Swords – interlaced, in accordance with early examples. Four of Coins/Pentacles Latin inscription, Inicit insipiens supremum iactibus assem, / ‘Hoc agat’ exclamans ‘ne bona cuncta fluant’ (‘The fool cries “May this preserve all my goods from loss” and throws his last farthing on the table’)*. * This was suggested by a remark attributed to the eighteenth-century Irish Member of Parliament Sir Boyle Roche, renowned for his muddle-headed eloquence: ‘It is the duty of every true lover of his country to give his last guinea to save the remainder of his fortune’. Ten of Cups, with demonic mask surrounded by leaves. The Latin inscriptions, in hexameter (or in the case of ‘The World’ hendecasyllabic) verse, were written especially for these designs.